Symbolizing many elements of married life. First, the doves are pure white - this represents the bride and groom beginning their life's journey together, pure and without regrets of their past. A marriage ceremony does not represent reaching a destiny, but rather the beginning of a journey. The doves fly higher and higher together as they seek their way home. They will not carry each other, rather they fly together - yet not so near to each other as to disrupt the flight of the other and cause a fall. You will see as they climb to greater heights that they will change from one direction to another until they find their bearing. So too the wedding couple cannot be certain what tomorrow will bring and their path may change many times along the way. You don't marry for the certainty of the future - rather for the faith that you will be stronger to face tomorrow, as you now have the strength of two and the strength of love. Finally, you will see that the doves will find their way home. No matter where they are or where they begin, they will always find their way home. The bride and groom will always know where home is... home is where they are both together. Orlando White Dove Releases has been in business for 35 years creating many special memories. 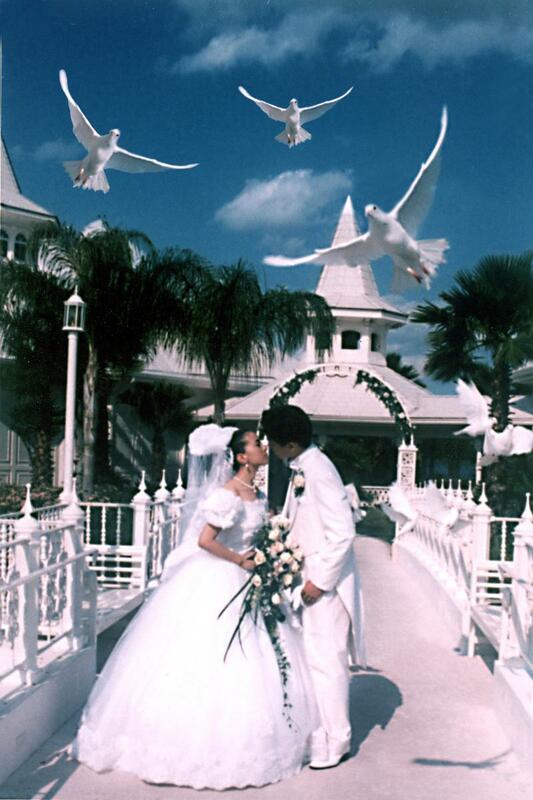 31 years experience as Walt Disney World's Loft Manager releasing their white doves at all weddings and special events. Copyright 2013 orlando white dove releases. All rights reserved.